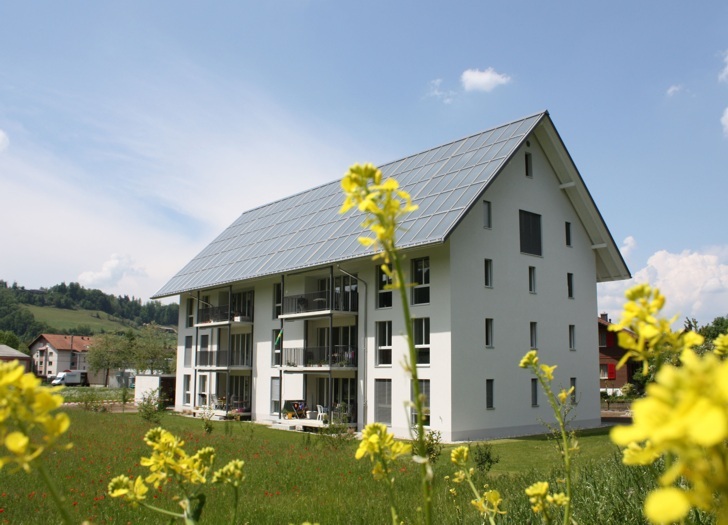 This apartment building in Upper Castle, Switzerland is the world’s first to be heated exclusively by solar thermal energy. The building borrows heavily from traditional Swiss chalet architecture with its steep roof and simple, boxy enclosure — except it is completely heated by the sun. In fact, developer Josef Jenni’s huge solar thermal roof produces twice the heat of what the building needs. Designed as the first building to use this technology at such a scale, the breakthrough apartment will serve as a model for future projects to come. 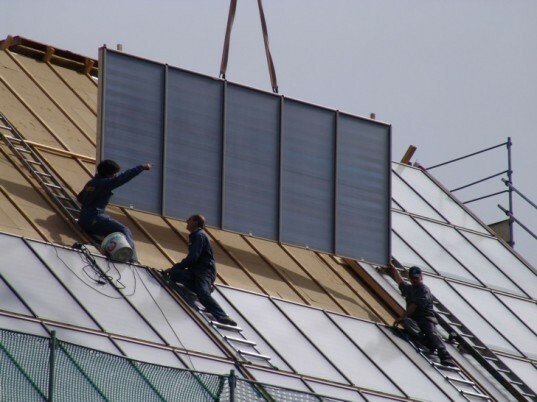 The traditional-looking building’s steep roof is set at the perfect pitch for solar thermal flat plate panels, which catch the sun’s heat and transfer it to a large water tank via a network of copper tubing. The system is basically a huge version of a standard hot water system – except there is no need for a back-up heat source. 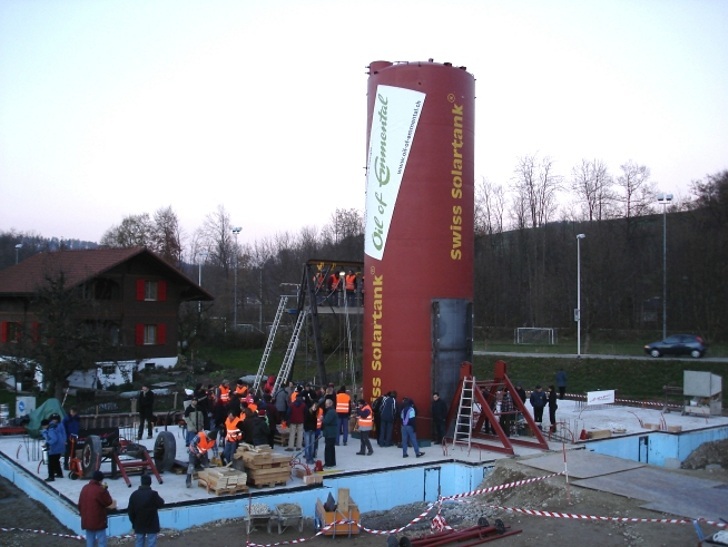 A custom 200 cubic meter tank in the middle of the building stands three stories tall and has coils at the bottom that transfer heated fluid from the panels. Through stratification, residents get very hot water from the top of the tank and the remaining energy in the tank is used to heat the under-floor systems installed throughout the building. The shell of the 8-apartment complex features highly insulated masonry walls that are extremely efficient in terms of r-value and by the elimination of thermal bridging. The heating systems in Josef Jenni’s next project will be 1/3 smaller, resulting in installation costs similar to ground source heat pumps. This apartment building in Upper Castle, Switzerland is the world's first to be heated exclusively by solar thermal energy. The building borrows heavily from traditional Swiss chalet architecture with its steep roof and simple, boxy enclosure -- except it is completely heated by the sun. In fact, developer Josef Jenni’s huge solar thermal roof produces twice the heat of what the building needs. Designed as the first building to use this technology at such a scale, the breakthrough apartment will serve as a model for future projects to come.